SERPWatcher is a newly released tool from the same company that supports KWFinder (read our KWFinder Review here) and SERPChecker, and was brought out with the intention of servicing website’s needs to track their search engine ranking position (SERP). SERP plays a huge role in how websites attract traffic to their pages and how businesses convert that traffic and drive sales. Coupled with the KWFinder tool that helps conduct effective keyword research, using SERPWatcher is a valuable addition that can help you to understand how your keyword research is paying off by tracking your SERP as it moves throughout ranking positions for various keywords. SERPWatcher is a valuable tool that provides insightful feedback that can help you either understand where the volume of your traffic is coming from, or it can track the progress of your SERP for various keywords. Let’s learn more about SERPWatcher and why it’s a valuable tool for your ecommerce website. SERPWatcher enables you to track the search engine ranking position of your targeted keywords as they fluctuate or remain relatively stable in search engine ranking results. 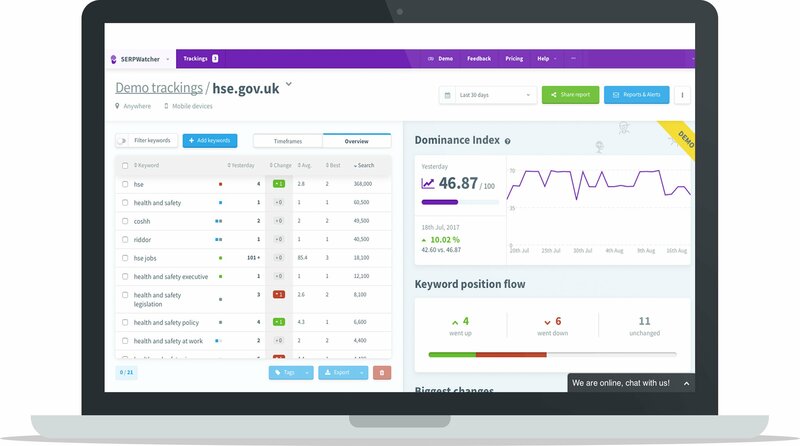 They focus on making SERP tracking both effective and easy to use, with a user friendly interface and optional email notifications to help you understand your SERP data and monitor it as it changes. 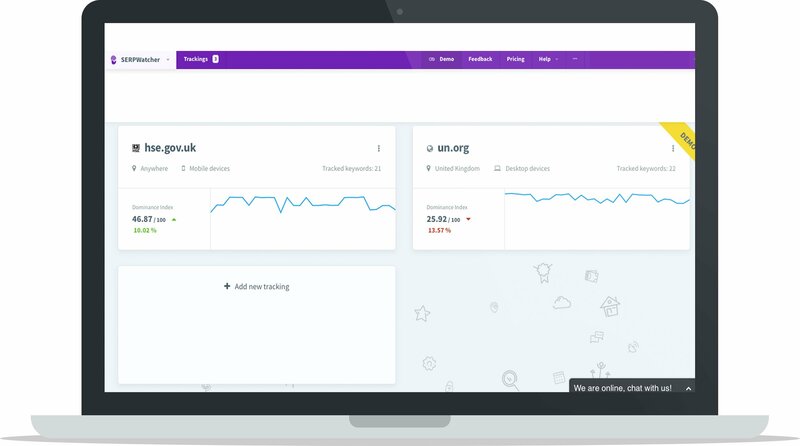 On your SERPWatcher dashboard you’re able to view all the relevant data you want access to including the keywords you’re tracking, the ranking position of each keyword, how their ranking positions have changed, the estimated search volume for each keyword and more. Beyond that there’s a useful report section that details the dominance index for each of the domains you track where you can measure your overall progress based on keyword positions and their estimated visits considering the different weight of each keyword you track. 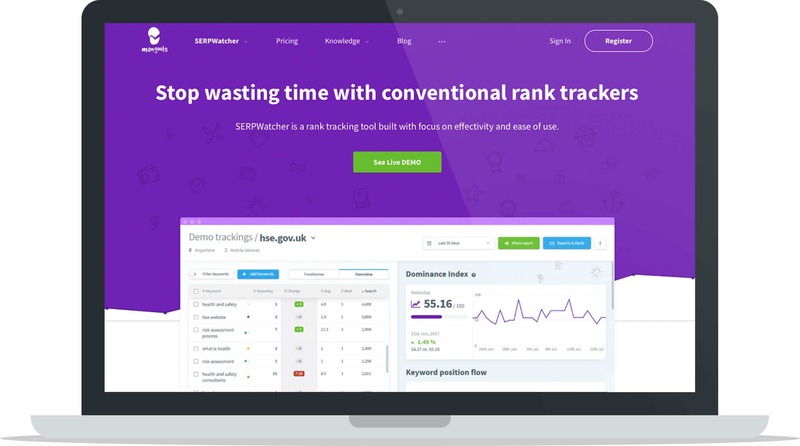 SERPWatcher is for people or businesses who have implemented some sort of keyword strategy into their website and want a way to manage and track the progress of their SERP. Since SERP plays a huge role in search engine optimization (SEO) and helps to demonstrate where your website’s traffic is coming from, what volume of it you’re receiving and overall just how your keyword strategy is working, SERP allows you to track and measure your progress which is useful for people or businesses who want data to back up their efforts. Keyword research and applying a keyword strategy into your website is hugely important for SEO, as we discussed more deeply in our KWFinder Review, and SERPWatcher gives you a way to measure your progress and get an overview of how your efforts are paying off, whether you’re actually meeting your targeted goals and actually ranking for the keywords you’re going after, or if you’re not and you need to reevaluate which keywords you’re going for. It’s a valuable way to get feedback from search engines, which otherwise isn’t an easily accessible thing to do, and since SERPWatcher focuses on making the data relevant and easy to understand, you can understand your SERP and the overall health of your SERPs overall without any prior knowledge on the subject. SERPWatcher gives you a way to measure your progress and get an overview of how your efforts are paying off, whether you’re actually meeting your targeted goals and actually ranking for the keywords you’re going after. This tool is the most worthwhile to use when used in conjunction with a keyword strategy, whether you’re actively conducting research with a tool such as KWFinder or your webpages are already optimized with keywords, so for best results we recommend using SERPWatcher when you already have a keyword strategy or will be implementing one as you’ll need to have keywords to measure in order to measure or track any sort of SERP data. When it comes to choosing how you want to add keywords to your SERPWatcher dashboard, you have the flexibility to enter keywords manually, import them from your existing KWFinder library, add from a TXT or CSV file, drag and drop from a TXT or CSV file or simply copy and paste from anywhere. You have the option to add and delete keywords even when the tracking is active, so you have the ability to modify your list of keywords as you go. To get an overview of each domain you’re tracking visit the tracking heading where all the basic info for each domain will be shown (such as any location specifications, desktop/mobile segmentations and number of tracked keywords) as well as the Dominance Index progress for the domain. Use the dashboard to view all of your data in one place via an organized two-column interface. In the left hand side column you’ll have an overview of the keywords you’re tracking, you can manage the time frame for the position progress of the keyword, choose to export the keywords from here, filter them by your preferences and more. In the right hand side column of the dashboard view your current dominance index plus a chart of its progress throughout the month, view a table of your top keyword rankers and outrankers, your keyword position flow which basically gives an overview of how your keywords have keywords progressed, declined and have not changed over time, and get access to more tables and metrics that chart the performance of your keywords. Since reports are essentially the main purpose of using the SERPWatcher tool, they’re created to track SERP in real time so they’re always up-to-date and moving alongside SEO as it shifts and changes. It’s likely that you’ll be able to see how the SERP of your keywords adjusts and moves when you start tracking them through SERPWatcher, that’s why the automatic alerts feature is so convenient. There are plenty of ways to manage the alerts you want to receive whether it’s a weekly or monthly report of SERP changes, or something more customized such as immediately when a keyword enters or leaves the top 10 or 100 ranking positions. It’s interesting to see how often the SERP adjusts when using a new keyword, so it’s worthwhile to sign up for the alerts. 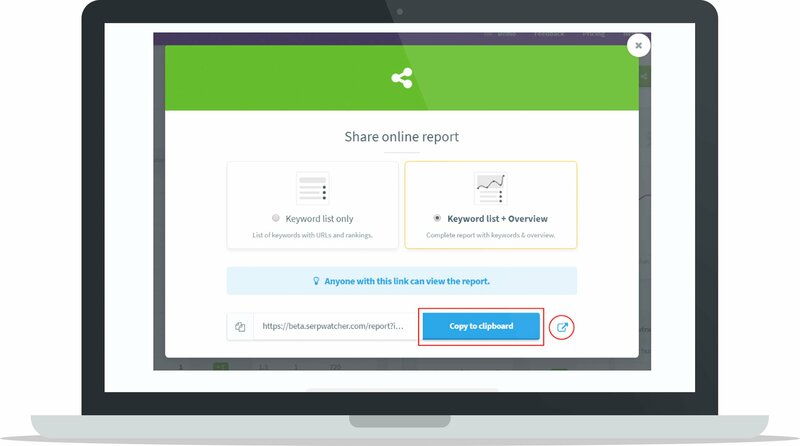 In terms of sharing the reports, SERPWatcher enables you to export interactive digital copies of the report so whomever you’re sending them to can also view the SERP of the keywords in real time. This function is important because if the reports weren’t interactive and digital when sharing them with others, it’s likely that they wouldn’t be relevant as SERP tends to change so quickly (and can change drastically). SERPWatcher’s main advantage is that it’s an easy to use, all-in-one dashboard that provides you with an overview of your keyword’s SERP performance with all the relevant data available to you at a glance. By adding in keywords as you see fit you’re able to create a custom menu of keywords that you can manage data for without overflowing your dashboard with irrelevant keywords or SERP data that you’re not interested in tracking. Make use of the convenient email update feature to get real-time updates when your keywords enter or leave the top 10 ranking positions (and thus, the first page of search engine search results). 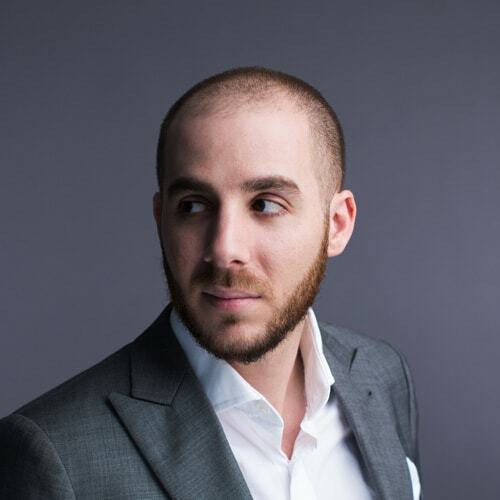 The main disadvantages aren’t exclusive to SERPWatchers itself, but tools relying on SEO data are in some cases relying on educated theories, and therefore some data may be over or underestimated. Estimated Data: Since some aspects of SEO are based on educated theories, some of the data SERPWatcher tracks may be over or under estimated. It’s worth bearing in mind to use the data as a very good indicator of your SERP but may not be 100% accurate all the time. 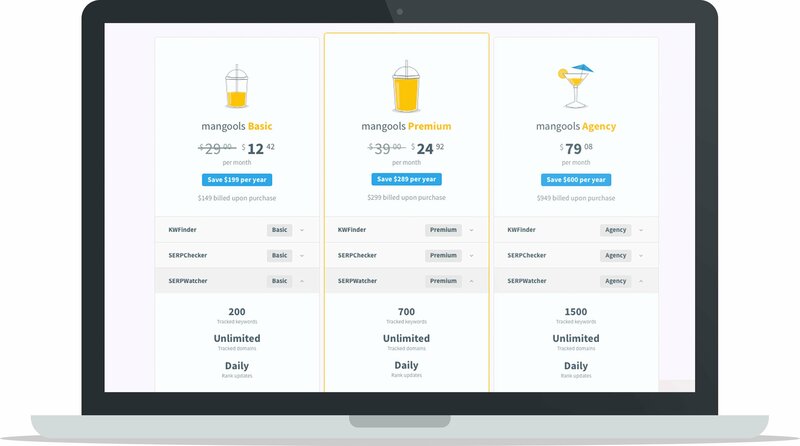 Pricing: Since the free pricing tier is a very limited offer per 24 hour period, in order to conduct effective SERP tracking you’ll most likely want to upgrade to a paid plan. The main difference between the pricing tiers is essentially how many tracked keywords you’re able to measure or search within a 24 hour period. This might seem like a lot of information, but the tool itself is very simple to use, there’s just a few main features to know about to make the tool work to its full potential for you. SERPWatcher is an excellent tool that provides data that can help you make better decisions when it comes to keyword research, and provides you with insight into your website’s search engine ranking position which is one important aspect of your SEO strategy. 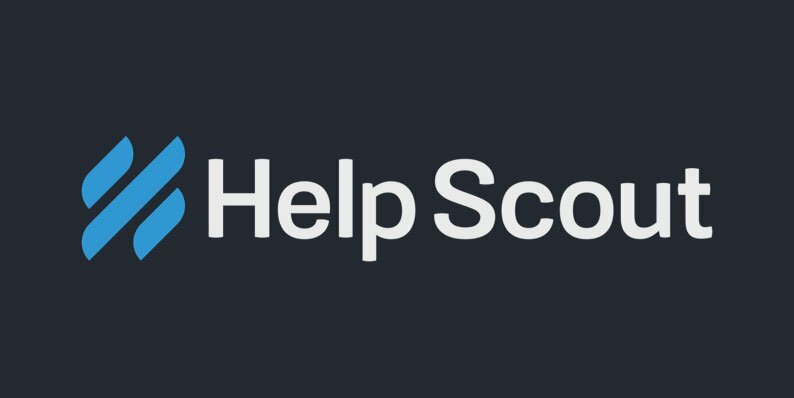 For more information about SERPWatcher and advice on how to use its features, check out the SERPWatcher Guide on the Mangools blog.